200 GUESTS GATHERED AT MIDDLE TEMPLE HALL ON THURSDAY 28 MARCH FOR THE 66th ANNUAL DINNER OF THE LEGAL GROUP OF THE BRITISH FRIENDS OF THE HEBREW UNIVERSITY. THE EVENING WAS HOSTED BY LORD PANNICK QC, CHAIRMAN OF THE LEGAL GROUP. THE GUEST SPEAKER, SIR TERENCE ETHERTON, MASTER OF THE ROLLS OF ENGLAND AND WALES SPOKE MOVINGLY OF HIS RECENT TRIP TO JERUSALEM AND THE HEBREW UNIVERSITY, WHERE HE HAD BEEN TO DELIVER THE 2018 LIONEL COHEN LECTURE. 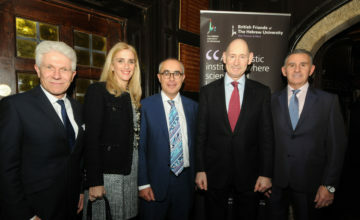 THE AMBASSADOR OF ISRAEL MARK REGEV WAS IN ATTENDANCE AS WERE A PLETHORA OF JUDGES, QCs, BARRISTERS AND SOLICITORS.